Illustrated lecture on George Antheil and the history of the Ballet mécanique. Includes projections, film clips, interviews with George Antheil, musical examples. WHO IT'S FOR: Music, film, and art history students, as well as general public. REQUIREMENTS: Video projector with VGA input, stereo sound system. LENGTH: 30-40 minutes + Question & Answer session. Documentary film: Bad Boy Made Good. REQUIREMENTS: DVD player, video projector, stereo sound system. LENGTH: 71 minutes (54-minute cut also available) + optional Q&A. A Ballet mécanique for the 21st Century: The robotic installation at the National Gallery of Art. 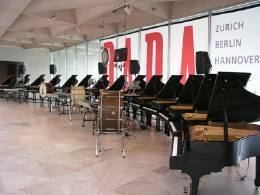 Includes the relationship between the Ballet mécanique and the Dadist movement, details of the construction and installation of the robotic instruments, and performance video in stereo or Ambisonic four-channel sound. WHO IT'S FOR: Musicians, art historians, mechanical engineers, electrical and robotics engineers, and the general public. REQUIREMENTS: DVD player, video projector with VGA input, stereo (or four-channel) sound system. LENGTH: 45 minute lecture + 11-minute film + Q&A. Lecture and Film: Ballet mécanique by Fernand Léger and Dudley Murphy, with new realization of original music by George Antheil, produced and edited by Paul Lehrman. WHO IT'S FOR: Film students, music-technology and film-scoring students, historians and fans of 20th-century avant-garde art and early cinema. REQUIREMENTS: DVD player, video projector with VGA input, stereo sound system. LENGTH: 20-minute lecture + 16-minute film + Q&A. Workshop on realization of Antheil's Ballet mécanique. Includes MIDI generation and editing, sample playback, synchronization with live performers, other performance issues. WHO IT'S FOR: Music-technology students, composers, conductors, electronic-music performers and producers. Includes live computer demonstrations. REQUIREMENTS: Audio mixer with at least seven inputs, two- or (preferred) four-channel audio monitoring system, video projector with VGA input. Workshop on synchronizing the Ballet mécanique film and music, for exhibition with pre-recorded track and for live performance. Includes score editing, real-time MIDI generation, sample playback, synchronizing and mixing acoustic and MIDI tracks, live performers, and film/video. WHO IT'S FOR: Advanced film-scoring and music-technology students, conductors. REQUIREMENTS: Two large computer monitors and/or projectors with VGA inputs, audio mixer with at least seven inputs, two- or (preferred) audio four-channel monitoring system. LENGTH: 60 minutes + 16-minute film. NOTE Elements of different presentations can be combined to make customized presentations. Multiple presentations in a day by arrangement.